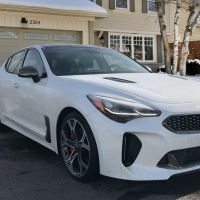 What kind of tips and tricks are people using for the Stinger at the drag strip? Recommendations for tire pressures for RWD vs AWD? I'm guessing for RWD you'd you max out the front tire pressure and drop a little off the rear tires? Does anyone remove the plastic engine cover and leave the hood open to help the engine cool off faster b/w runs? Use bags of ice on the intake manifold to help cool off the engine b/w runs? Push your car through the staging lanes to keep engine temps down? Try to make it the drag strip with a 1/4 tank of gas or less to save weight? Fold in their side mirrors to reduce drag? Appreciate any advice you can share from your experiences with Stinger at the drag strip. I've seen people deflate their tires but have never done it personally. One thing I do it always keep the engine off while in the staging lanes and no more than 2 back to back run. I also keep the tank as low as possible with enough gas to get home. Don't forget to bring a helmet since our cars can easily get into the 13's. Deflate tires to 29-30 psi. Make sure you are at a 1/4 tank or less for your runs. Avoid water box (RWD and AWD) Unless ambient tempts are at or below 50F (applies for stock Michelin tires). Use LC. Start accelerating at the first yellow light after staging. Engaging LC. Lift hood to help cool down engine between runs. If you can get a JB4 with WMI and that will put you easily in the 11 sec bracket. Ahh good point about the helmet! I never ran my STI at the drag strip and my other cars were 14 to 15 seconds in the 1/4 so I never had to worry about bringing a helmet. Thanks for information about the tire pressures! All good tips. There was no getting around the water box at my local track and it killed me. Be sure to update with your time slips! I wanna see what ya did.